Womens specific mountain bike skills course with Jess Stone. 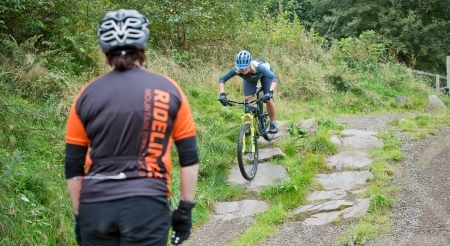 So why a Womens specific mountain bike skills course? 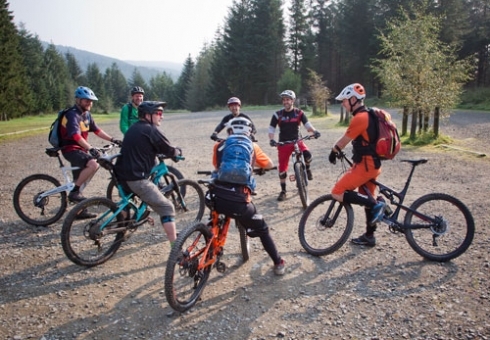 While we do have a high volume of women who attend our scheduled courses, you might prefer to learn your essential mountain bike skills in an all female environment, and we can provide exactly that. We can run sessions for you on a 1:1 basis so you get custom made skills tuition to meet your exact needs. If you have a group of girls who want to learn new skills together, we will tailor a session to suit your group’s skill and experience. It’s guaranteed to be fun, supportive and progressive, ensuring that you make the most of our experience for long term skills development. Jess is a legend in The Tweed Valley. She’s a former international (UCI World Cup) Downhill racer and 2008 junior national champion. Not content, she was also Elite National DH champion in 2010. She’s also part of the touring street Velodrome team and a dynamite rider all round! Not only is she an accomplished MTB instructor for ridelines, she’s all the above and 2015 Scottish Under 60kg novice boxing champion… Phew! It doesn’t matter whether you are a beginner or new to mountain biking or really stretching your limits to the most technically challenging trail out there. Whether you like to race or just like to have fun on a bike, we will create a women’s specific course that’s perfect for you and/or your group. So if your starting out, looking for core bike skills, racing Enduro, Downhill, XC, or simply looking to make the most of your riding time, get in touch to arrange an all female skills day. Courses as scheduled. Private tuition and 1:1 sessions can be arranged for you or your group. Contact us for a quote. PUMP N’ JUMP Essential skills to ensure correct speed and commitment to jumps, timing your jumps, getting your wheels off the ground in a controlled manner, pumping through berms, body position for a smooth flowing ride, compression for grip and speed. Get to grips with front and rear wheel lifts for clearing obstacles on the trail, maintain speed and control and flying drops to get you dropping with style. ROCKS, ROOTS & CORNERS Tackle and master rock and roots, sustained rock features and all manner of showing the basalt who’s boss. Take control and confidently ace big, small, off camber and slippy roots, stay loose and in control. Master cornering maintaining grip and speed to really enhance your riding. Grade of rider from: Confident Red Grade / Black Grade / Freeride / Recreational / Recreational Racer / Competition Racer. Must be able to tackle red / black trails. Good level of fitness. 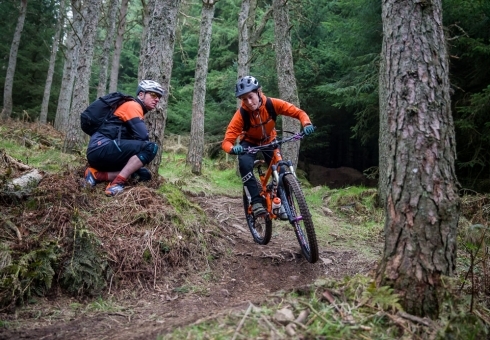 Sessions generally run from Glentress Forest, Peel Car Park or Innerleithen or hand picked trail in the Tweed Valley. Speak to us at the time of your booking. Maximum group size is 6. Half day workshops run for 3 hours in either am or pm slots. Full details provided following booking. What a difference Jess has made to my off-road biking confidence! She was so patient and thorough that I knew I was in good hands from the beginning. She knew exactly how to pitch the lesson to my level of experience and would not let me move on until I had clearly understood the aim of each exercise. After the tutorial I cycled back up the hill and did Berm Baby Berm another 3 times – I hope Jess would have been proud of my lines by the end! I learned such a lot and had a fantastic time, I cannot recommend Jess and Ridelines highly enough, she truly is a credit to the company.